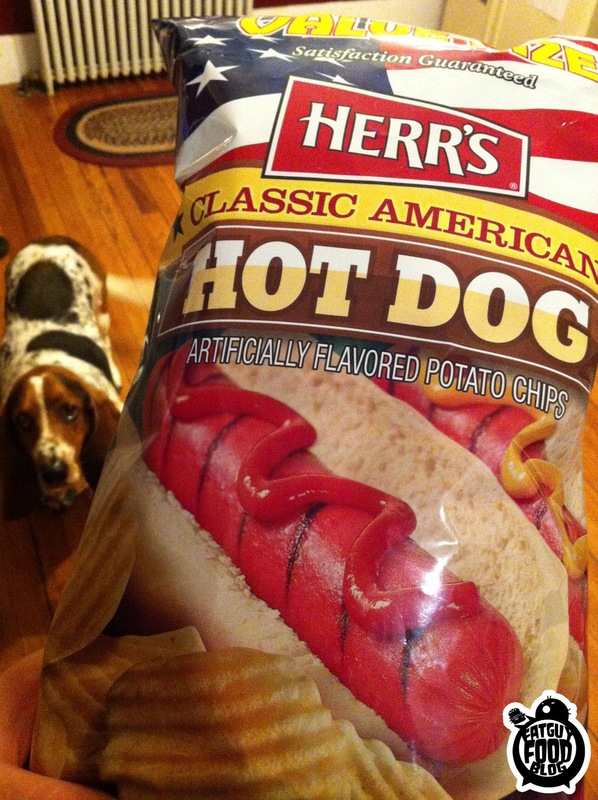 FATGUYFOODBLOG: HERR'S Classic American Hot Dog chips! HERR'S Classic American Hot Dog chips! Sometimes being a food blogger, you buy something at the store just because it's new and you figure you'll do a review of it. But then sometimes after this item has been at your house, sitting on the shelf for a few days, you stop and realize that you have no desire whatsoever to try this item. So you put it off. For weeks and then even a month. But then one day someone emails you requesting you review that item and so you know that you have to dig down deep and take one for the team. 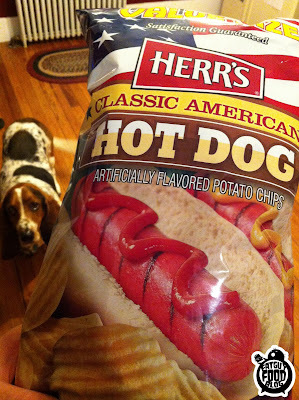 HERR'S CLASSIC AMERICAN HOT DOG POTATO CHIPS! Now, I'm a fat guy, I like a hot dog just as much as the next guy. I'm not about to join any eating challenge where you dunk the buns in water and jam them down your throat, but hell, if you're grilling up dogs, toss a couple on for me, and I'll throw them in a bun with cheese, and any strange flavored mustard you have. (currently really enjoying a Maple Horseradish mustard I got at a little local shop here). 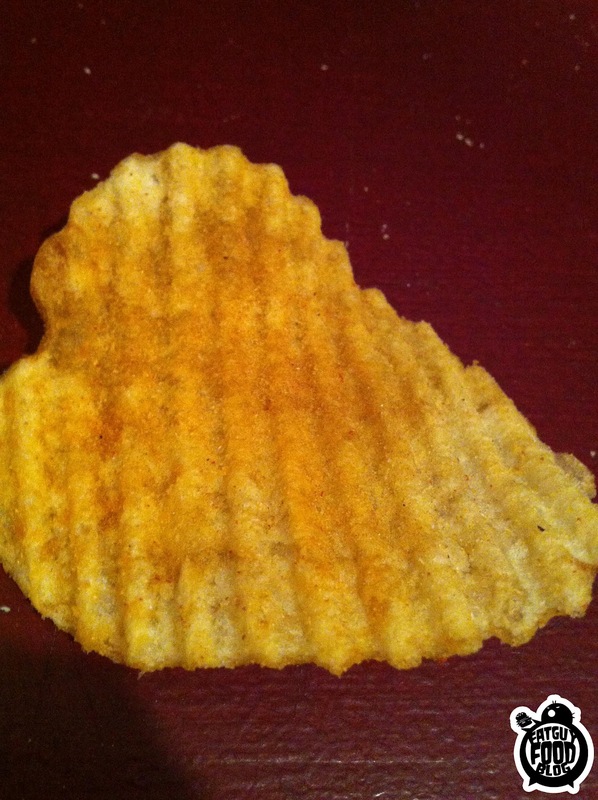 But let's face it folks, perhaps there are some things you shouldn't flavor potato chips like. Now Herr's isn't the first company to tackle the hot dog flavored chips, and they won't be the last. The common thread with them all is that they mostly taste like the condiments you put on hot dogs. Same goes with most "Burger" flavored chips. These aren't very different. They are okay potato chips, covered in what first taste like a salt & vinegar flavor. But then your mouth realizes what it's tasting is a strange mustard/ketchup hybrid. The weird part comes with the aftertaste though...when it kind of tastes like the hot dog itself. This kind of grossed me out. I have to be honest. Hot Dogs are one of those foods that has a bad name from people talking about how they are made up of snouts and feet and all the rest of the stuff meat packing plants can't use in anything else. I tend to buy the more expensive hot dogs, and figure, hey, if they are made up of all those things and they still taste this good, who cares. BUT...when that taste hits you at the end of these chips, I found my mind going there and then just realizing that it was kind of a gross taste in a chip. I also found that after a few my mouth was stinging. Much like eating a bunch of salt & vinegar chips. So they sting your mouth, they taste like you squirted a bottle of ketchup & mustard directly onto your tongue, and then you are left with the taste of hot dog meat...I really can't say I liked these chips at all. I feel like they are the kind of item you would trick people into eating. "HAHA YOU ATE HOT DOG CHIPS!" and all your buddies laugh while you're grimacing and wondering if you should spit out the half eaten chips. If you find yourself intrigued by them,and you're a big hot dog fan, by all means, pick them up. But I could only find a gigantic VALUE SIZED bag. I needed about a handful of these for this review & there's nobody in the Fatguyfoodblog house who wants the rest so they are most likely hitting the trash. So good luck. I give these chips a D on the snack scale. 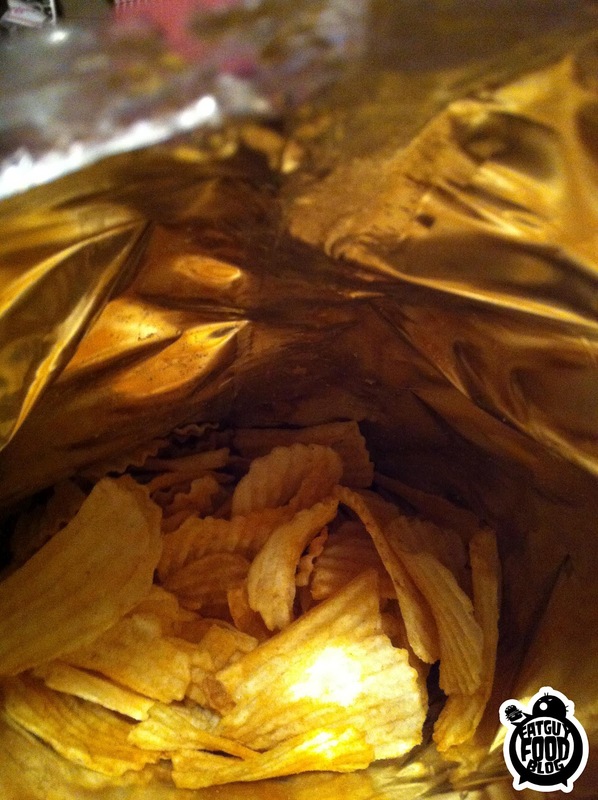 I've eaten these chips before. Best chips ever!!! I actually kind of liked these in an odd way... They do taste mostly of mustard, but I love vinegary tastes, so maybe that's the appeal. I did feel like the "hot dog" taste was a bit unusual, though. I recommend staying far, far away from the Prime Rib chips if you can help it. They are flat out disgusting. haha, thanks. big people definitely like to talk about food. Glad you're a fan.